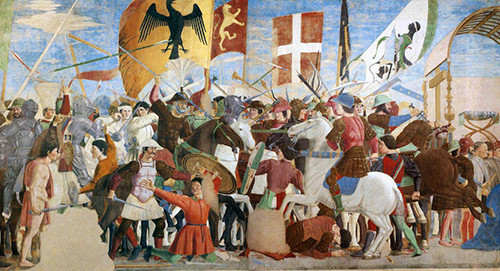 Something not to miss is a trip to the city of Arezzo and a visit of the Basilica of San Francesco, where the magnificent project of restoring the series of frescoes by Piero della Francesca has been completed: The Legend of the True Cross. A day of discovering art at its roots. An itinerary to discover two cities which are considered among the most beautiful of all Tuscany. 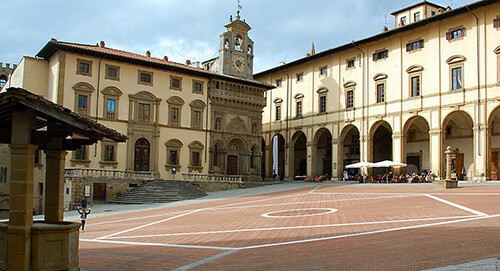 Setting off in the morning, we recommend visiting the beautiful city of Arezzo with its charming historic centre. The central square is fabulous and you must not miss the Basilica of San Francesco where the restoration of the series of frescoes on the Legend of the True Cross by Piero della Francesca (15th C.) has been completed. The itinerary continues with the discovery of the ancient city of Cortona, perched in a panoramic position at the eastern edge of the Valdichiana. Amid the gently rolling hills of the Chianti Classico region, located between Siena and Florence, you will find yourselves surrounded by a breathtaking landscape in the heart of the kingdom of the Gallo Nero (Black Cockerel symbol of the Chianto Classico region). A tour of the most famous wine producers and a tasting of the most famous wines of this land: an opportunity that real wine lovers should take advantage of immediately! During your tour the most beautiful wineries in this valley are well worth a visit, perhaps accompanied by a wine expert or sommelier during your visit or wine tasting. At least half a day without doubt must be dedicated to visiting the splendid little town of Montalcino and one of the most famous wineries that produce Brunello. 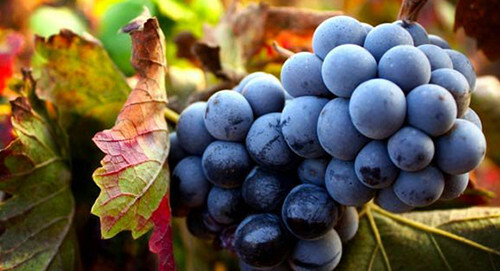 During the guided tour of the cellars you will be able to taste the best wines and the best of all, Brunello. The lush territory of Chianti Classico has always been glorified for its renowned beauty of the landscape and historic heritage, and it deserves to be visited not only for the wine! 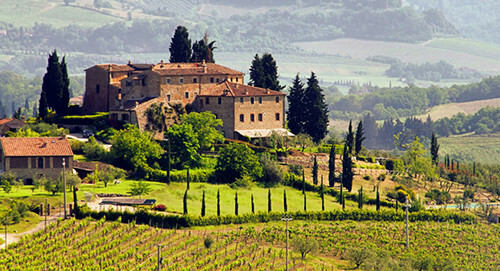 A tour of the villages lasts one day following a panoramic road, the historic Chiantigiana which passes all the way through Chianti and takes you to the most famous medieval castles and gorgeous villages which have made this area famous. 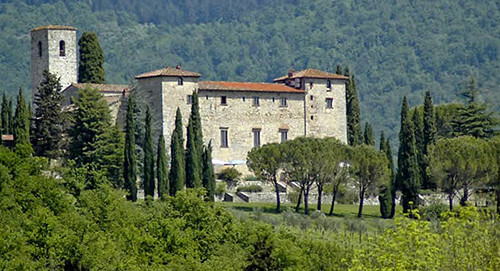 Worthy of a visit are the magnificent Castle of Brolio and picturesque villages such as Radda, Greve or Castellina in Chianti, where you can enjoy a magical atmosphere and beautiful landscapes, following the most beautiful roads of this magnificent Tuscan land. This tour was conceived for real lovers of the lesser known Tuscany who want to seek out incredible locations with mostly unspoilt views. 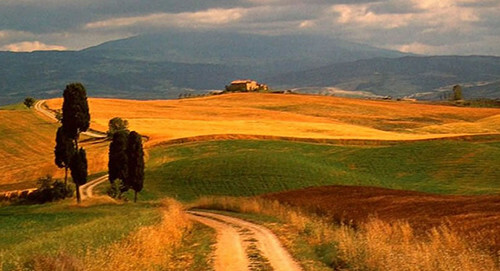 Lands brimming with legend and breathtaking landscapes: the Crete Senesi and Valdorcia. Passing through the magnificent landscape of the rolling hills of the Crete Senesi area, the land of wheat, truffles and pecorino toscano cheese, you come to Pienza, known for its famous pecorino P.D.O. cheese and for the cathedral built by Pope Pius II. The tour ends at Monticchiello, a little known gem but still unspoilt where there are alleys and lanes which create an impression of being transported into the past with architecture that has stood intact for centuries.